On the occasion of the 1st of May Labor Day celebrations in Geneva, UN interns, staff and consultants, as well as students are invited to join the march for a paid, fair and equal Internship at the UN! 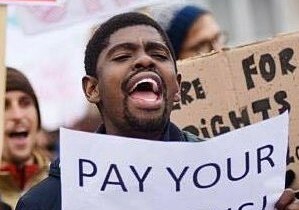 WE WILL MARCH for thousands of unpaid interns who struggle to make their ends meet, but especially for all those talented youth who are discriminated, as they can’t afford to work for free. WE WILL MARCH for quality internships, with real learning contents, meaningful tasks and responsible supervision. WE WILL MARCH for access to justice, protection from harrassment and basic labor rights like leave days and sick leave. Meeting point at 12:30 in front of the Palais des Nations Broken Chair for a group photo, to join afterwards the larger demonstration at Boulevard James-Fazy at 13:30.